FOUNTAIN VALLEY, Calif., May 17, 2016 – Spring is great time to buy a new crossover or SUV, especially if you are a part of the U.S. Military. In honor of Memorial Day and to support its presenting sponsorship of the National Salute to America’s Heroes, Hyundai is doubling the military incentive on its crossovers and SUVs for United States service men and women. Any active or retired military personnel and their spouse can receive $1,000 toward the purchase of a new Hyundai Tucson, Santa Fe Sport or Santa Fe between May 19 – 31, 2017. The incentives are offered in advance of Memorial Day allowing military personnel two weekends to take advantage of the discount. Hyundai’s existing military incentive program of $500 off will continue to apply to other Hyundai models. On Memorial Day weekend, the National Salute to America’s Heroes presented by Hyundai pays tribute, honors and celebrates the military and first responder heroes. On May 27 – 28 in Miami Beach, a patriotically infused two-day festival wrapped in a world-class Air & Sea Show will showcase the country’s state-of-the-art military technology, dynamic sea events, the finest musical talent and more. In addition to being the title sponsor of the event, Hyundai will have several vehicles on display in Miami. This partnership continues Hyundai’s long commitment to supporting the U.S. military and its most recent Super Bowl marketing program Operation Better. The incredibly well-received Super Bowl spot documented several U.S. soldiers watching the Super Bowl in individual 360-immersive pods that virtually seated them in Hyundai’s luxury suite at NRG stadium and culminated with a surprise family reunion. The entire experience was shot, edited and produced during the Super Bowl and ran in the commercial spot immediately following the conclusion of the game. NATIONAL SALUTE TO AMERICA’S HEROESThe National Salute to America’s Heroes presented by Hyundai is a nation-wide two-day celebration held on Miami Beach, Florida featuring the Air & Sea Show presented by Hyundai, Music Explosion presented by Hyundai and Salute 365 initiative. Held Memorial Day Weekend, the National Salute to America’s Heroes presented by Hyundai focuses on the service and sacrifice the military and first responders make to protect the freedoms of all Americans. For more information visit http://www.usasalute.com. The 2017 Hyundai Ioniq Electric is one of the newest battery-powered vehicles to hit the market, and among the latest-generation of all-electric vehicles that started with modern pioneers like the Nissan Leaf and continues with the 2017 Chevrolet Bolt. The Ioniq is actually the name of a trio of electrified cars in the Hyundai lineup. As its name suggests, the Ioniq Electric is, you got it, all electric. The other two players in the lineup are the Hybrid and Plug-in Hybrid, which have a traditional gasoline engine along with an electrified powertrain. In addition to not having a gasoline engine, the Ioniq Electric differs from its siblings in availability, price and the way it drives. It's only in available in California for now, with rollout in other states to follow. Regarding the second point, the Ioniq Electric starts at $30,335, vs. $23,035 for the Hyundai Ioniq Hybrid (pricing for the Ioniq Plug-in Hybrid will be announced when it arrives later this year). But there's a welcome asterisk: The Ioniq Electric is eligible for rebates. In California, up to $10,000 in incentives are offered, which would reduce the cost to $20,335. Then there's the way the 2017 Ioniq Electric drives. In this sense, the Ioniq EV is similar to any other all-electric vehicle. It has instantaneous power response, making it quick off the line and acceptable when passing at speed. It's smooth and silent. So silent that at low speeds it emits a warble-like sound to alert pedestrians of your presence. When backing up it beeps, not unlike a delivery truck. Hyundai aimed to inject engaging manners into the Ioniq, and while it can be fun to silently and swiftly blast away from others at a stop light, this compact hatchback isn't all that adept at carving corners. Push it and the tires protest, because the low rolling resistance rubber prioritizes efficiency over grip. More satisfying is the engagement that comes via two paddles on the side of the steering wheel column though their role is far different from sequentially shifting up or down gears. Instead, these levers vary the level of regenerative braking. The Ioniq Electric has four levels of regen braking in all. Starting with 0, it feels like a normal car, in which ordinary rolling resistance will eventually slow car. That resistance ramps up, with 1 being not all that intrusive, 2 being quite noticeable, and 3 definitely apparent. At level 3, as soon as you lift your foot off the accelerator, the car slows significantly, nearly to a stop with enough distance. This kinetic recovery helps recharge the battery and thereby extend the vehicle's range. Using the paddles in the Ioniq Electric proved surprisingly gratifying, both in more dynamic driving and simply around town. In the former, it was useful for imitating engaging a lower gear to use engine braking as a way to slow the car around a bend or down a steep hill. In stop and go city driving, it enabled me to brake less. Time a signal right, and you can slow the car enough via the regen without ever touching the brake pedal. There's also something inherently gratifying knowing that otherwise-wasted brake energy is juicing the battery. Using the paddles in such a manner can seem foreign at first, but I quickly caught on. After two days of driving the 2017 Ioniq Electric, it almost became second nature. If you don't want this extra interaction, it isn't necessary. Once you find a regen level you like, you can keep it there. And through the central display screen, you can even customize and set the level according to each drive mode. For example, if you want Level 1 as standard in normal driving mode, Level 2 in Eco and Level 3 in Sport mode, you can make it so after pressing the "EV" button and then using the touch screen to enter your preferences. While there, you can also customize the climate control settings for each mode, from standard to eco. There's no doubt the Ioniq Electric faces a stiff rival in the Chevrolet Bolt EV that boasts a range of 238 miles to the Ioniq's 124, but along with a roomier cabin, lower starting price and arguably sleeker design, the Ioniq Electric's ingenious use of paddles and customizability warrant a look. April 28, 2017 – Hyundai Motor is unveiling further details of the All-New KONA ahead of its world premiere in the coming months. 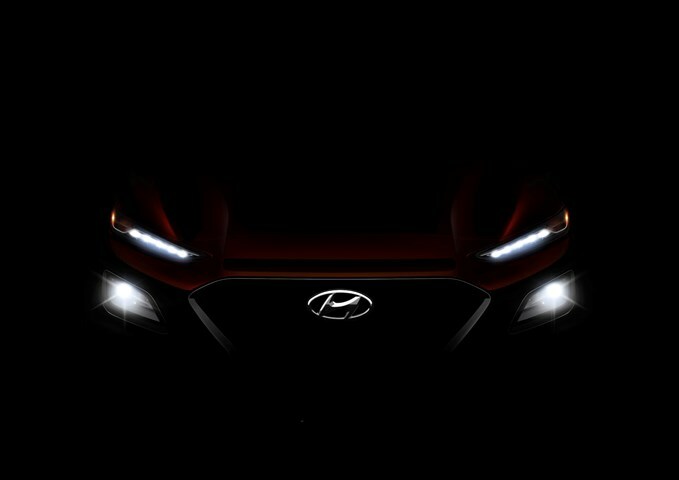 The All-New KONA continues Hyundai’s new design identity while adding its progressive character to create a unique proposition in the sub-compact SUV segment. The All-New KONA’s front is expressive and powerful, adopting Hyundai Motor’s new family identity, the Cascading Grille. The new twin headlamp enhances the visual impact, with the LED Daytime Running Lights positioned on top of the LED headlights. The separated lights at the front deliver a confident, progressive appearance with sleek and sharp shapes. The All-New KONA will set new standard for compact SUV segment. It provides better visibility for drivers increasing driving comfort, while agile driving dynamics will provide better ride and handling experience for the customers. The imminent arrival of KONA marks Hyundai Motor’s bold first move into the B-SUV segment and leads the wider expansion of its SUV range. The KONA name continues Hyundai’s tradition of naming crossover and SUV models after acclaimed travel destinations – notably the Creta, Santa Fe, Tucson and Veracruz – with the new compact SUV reflecting many of the lifestyle attributes of the desirable KONA district on the Big Island of Hawaii. FOUNTAIN VALLEY, Calif., April 27, 2017 – Hyundai’s 2017 Elantra SE, 2017 Sonata Hybrid and 2017 Tucson models have been recognized as having the best fleet value in their respective categories by Vincentric, a trusted name in measuring and analyzing overall cost of vehicle ownership and operation. The Elantra led the compact category in best fleet value for the third time, while the Tucson won its second award in the compact SUV/Crossover category. The 2017 Sonata Hybrid rounded out Hyundai’s wins with its first honor in the hybrid segment. The Vincentric Best Fleet Value in America Awards recognize specific vehicles and trims which have the lowest total cost of ownership in the greatest number of measured lifecycle cost scenarios. Now in its 12th year, the prize measures cost-of-ownership using eight different cost factors: depreciation, fees & taxes, financing, fuel, insurance, maintenance, opportunity cost and repairs. Winners were identified by determining which vehicles had the lowest fleet lifecycle cost in the most scenarios for its segment.